Architectural mimicry is tightly interwoven with the history of tourism. Few styles proved as inspirational in tourism placemaking efforts as those that evoked old Spain. Spanish-influenced styles became staples in the creation of regional architecture in California and Florida and occasionally in less expected places. 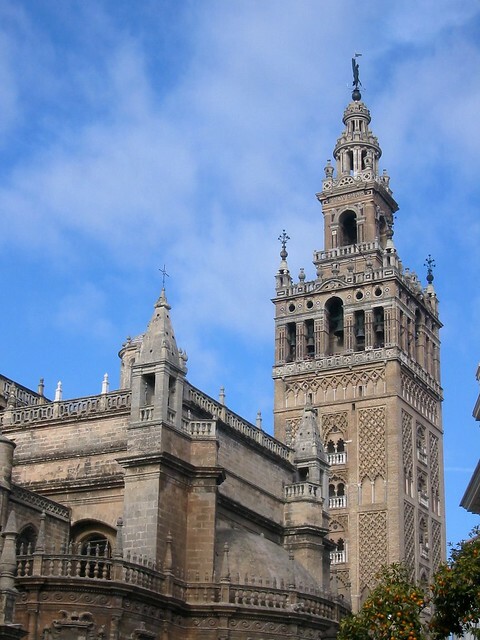 Perhaps no structure excited so many replicas and emulations as the Giralda in Seville. Today we’ll explore two of them. The Giralda was originally constructed as the minaret for a Moorish mosque patterned after the Koutoubia Mosque in Marrakech, Morocco. Both were completed in the late 12th century. Following the 13th-century Reconquista, the 343-foot-tall structure became a tower for the Cathedral of Seville. It is among the most recognizable buildings to tourists in Spain. Spanish architecture or, more properly, various amalgams of Spanish Renaissance, Moorish, Italian Renaissance, and other Mediterranean styles, shaped the designs for some of the leading American resort hotels in the Victorian era. In St. Augustine, Florida, alone, railroad baron Henry Flagler operated three: the Alcazar, the Cordova, and Ponce de Leon – all of them constructed in the 1880s. While these drew inspiration from Spanish designs, the Giralda Tower prompted more conscious replication four decades later. In the 1920s, American real estate developer J. C. Nichols translated youthful adventure travel into the premier tourist destination in Kansas City – Country Club Plaza. 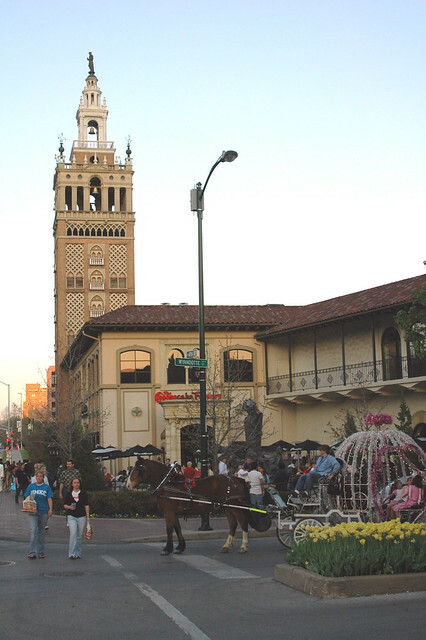 Inspired by adventurous summers in the American Southwest and Europe (detailed in the Country Club Plaza web exhibition) Nichols conjured an evocative real estate development that would transport shoppers and sightseers to a Spanish fantasy. Thus, when the nation’s first automobile-oriented suburban shopping district opened in 1922, it sported stuccoed walls, red-tile roofs, fanciful towers, tile murals, and fountains. Its centerpiece was a half-size replica of Giralda Tower. In the same year that Country Club Plaza opened in Nichols’s swank Country Club District, Miami developer George E. Merrick opened Coral Gables, a master-planned, Mediterranean-influenced suburb. Coral Gables, which also provided a campus for Merrick’s new University of Miami, became home to another less exacting imitation of the Giralda in 1926. 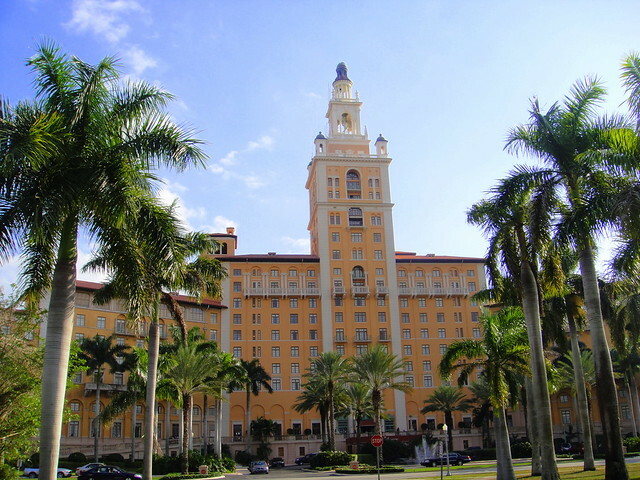 The tower furnished the inspiration for the same architects who created Flagler’s Breakers Hotel in Palm Beach to fashion the stylized central tower of the Biltmore Hotel. These Spanish fantasies are hardly unique. Tourist towns from Naples, Florida, to Venice, California, have borrowed liberally from Mediterranean and numerous other architectural models. The inspirations may be foreign but, as noted in American Tourism: Constructing a National Tradition, “adapting and altering styles from abroad and the past to suit local programmatic and emotional needs is as American as apple pie.” And, in most cases, it has required “the establishment of centralized control or at least dominance by leading individuals who share an aesthetic vision” – a Nichols or a Merrick. Given my work on Spanish history, we should do a joint presentation some day where I talk about the history and architecture of Seville and then you share this information–could be fun! Yes, that also might attract a wide-ranging audience. Thanks for your comment!